Stealthily pocketing an actual, physical piece of a national monument is a modern-day no-no. But back in the day, it was pretty common to sneak a little something special to remember your trip by. The bizarre souvenirs that remain give us a glimpse at how tourists of the past memorialized their experiences. Souvenir Nation: Relics, Keepsakes, and Curios is a new exhibition (and accompanying book) at the Smithsonian's National Museum of American History chronicling a truly eclectic set of collectibles. But this ain't just some survey of mass manufactured tat purchased at some of the world’s most popular landmarks. Instead, it’s a fascinating peek at times gone by, when the concept of preserving a moment or memory meant something way different than picking up a few postcards (or, you know, posting a few Instagrams). A small remnant from George Washington's lead-lined mahogany coffin when he was moved to a new tomb in 1837. As such, the featured objects represent a pretty wide array of direct-from-the-source ephemera, including everything from an excavated piece of the castle dungeon where Joan of Arc was imprisoned in the 1430s to a small, colorful fragment of the Berlin Wall. Each souvenir also has some kind of authentic, accompanying letter detailing its provenance—like a handwritten screed attached to a bit of Plymouth Rock. “It’s just chunk of granite without the note that someone thought to leave with it,” Bird says. Sort of like a non-fictional Significant Objects. Then there’s the stuff that you’d probably never, ever have the chance to gather now. For example, an employee at the National Institute for the Promotion of Science at the U.S. Patent Office in the mid-1800s named James Varden began, on his own time, soliciting snips of hair from US Presidents and “Persons of Distinction.” Not recommended now: approaching Barack with a pair of clippers. Scroll down to check out some more of the oddities on file, or check out Souvenir Nation: Relics, Keepsakes, and Curios, on view until August 2014. Looks like an ol' cracked cube—which yes, it is—but it's also debris from the Bastille. This Statue of Liberty model was one of the first made (and sold) in 1885 to help finance construction of the base of the real deal, which was dedicated the following year. Much of the stone that made up the dungeon where Joan of Arc was imprisoned was shipped from Rouen, France to New York in 1914, in order to preserve it when a new building was being erected on the site. It was eventually used as part of the pedestal on her commemorative statue on Riverside Drive, apart from a few stray pieces. U.S. Patent Office employee James Varden personally solicited the majority of these locks starting in 1850. 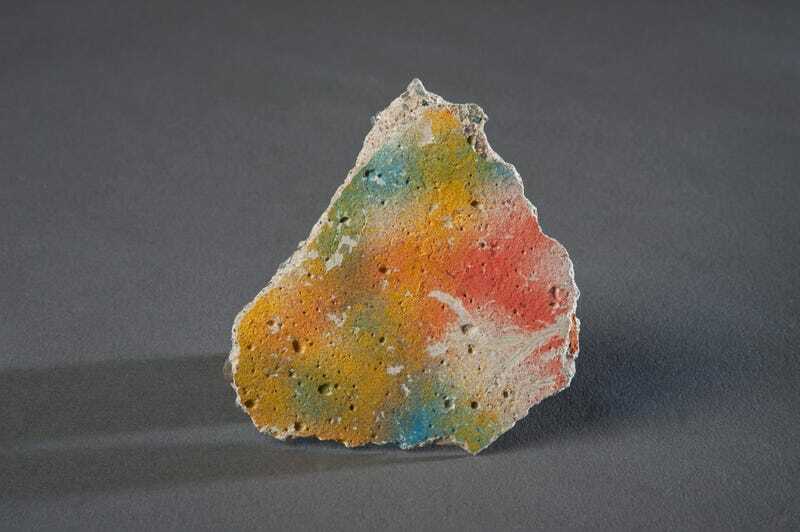 Lead image: A fragment from the Berlin Wall sold from a German flea market to a Canadian student to hawked it online.